Based on the comments from my post featuring a couple of the new premium paper stacks from Die Cuts With a View last Sunday, there's little doubt that DCWV is a favorite of many scrappers! With their wonderful quality and variety, they're sure to have something to please every scrapper. 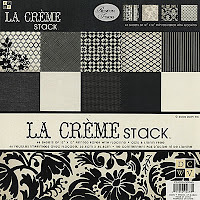 However, there's only one lucky scrapper out there that is soon to have the classically elegant La Creme stack to add to their stash. That lucky scrapper would just happen to be commenter #40! Congratulations, Deb! Please be watching further instructions on how to claim your prize in your email inbox. Stay tuned for more great giveaways coming soon! !